CHAUVET®, a leading manufacturer of professional lighting, announces the release of Cirrus™ an incredible new laser, featuring a unique green and red laser web effect combined with a deep-blue LED ripple effect. The layered colored textures create a mesmerizing projection effect for walls, ceilings or any surface. You can blanket any room with a colorful web of red, green and blue. Cirrus™ is a versatile plug-and-play fixture with separate controls for lasers and LED. Each laser is independently controlled for strobe speed, the LED is fully dimmable and there is a rotation control which changes the LED and both lasers at the same time—creating exponential effects at your finger tips. The fixture also has three operating modes: manual, automatic and sound-activated. 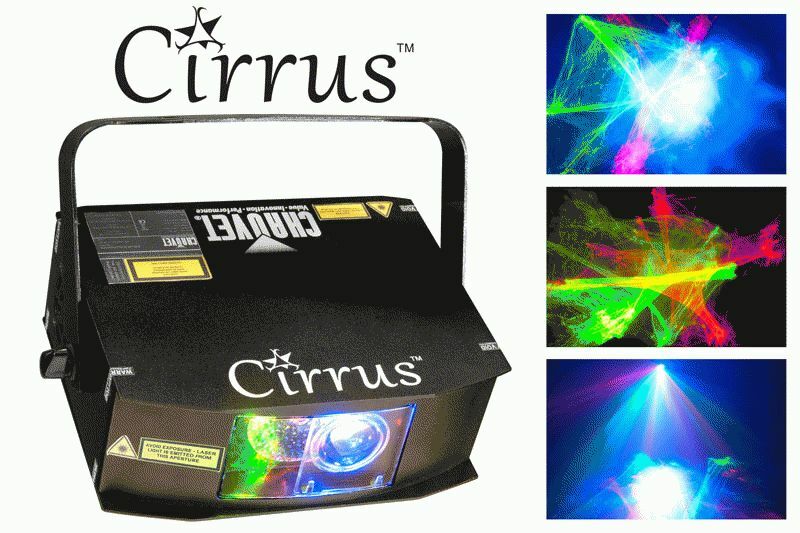 Cirrus™ power supply is UL listed and ideal for small clubs, bars and the mobile performer. It’s extremely portable and lightweight—only 3.6 pounds. It’s a fantastic lumia/ripple effect laser for any starter rig or a distinctive addition for the well-seasoned mobile performer.